For those who are STILL unsure just how vile Iain & Duncan Smith are then here is another example of how utterly out of touch they are. 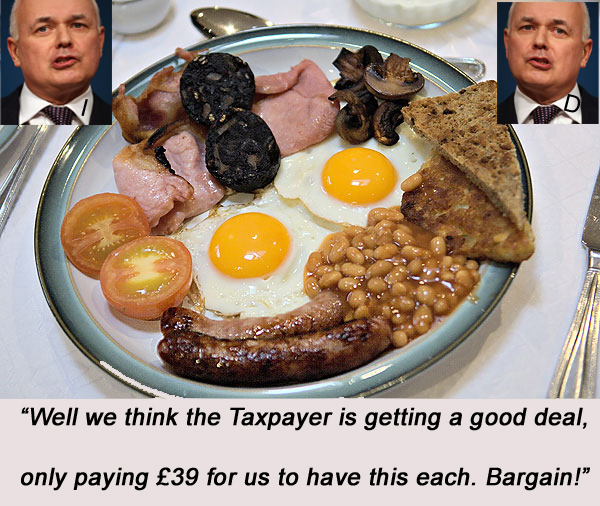 Having claimed the ability to live on £53 A WEEK it has emerged a claim had been made, from the pockets of hardworking taxpayers, for breakfast at £39 A HEAD! This entry was posted in Comment, Expenses, Fraud, Loathsome, Politics, Tory and tagged Breakfast, Claim, Expenses, Expenses Scandal, iain duncan smith, MPs' Expenses, Secretary of State for Work and Pensions. Bookmark the permalink.